The Chicco Lullaby Baby Playard helps your little one sleep soundly through big life changes. 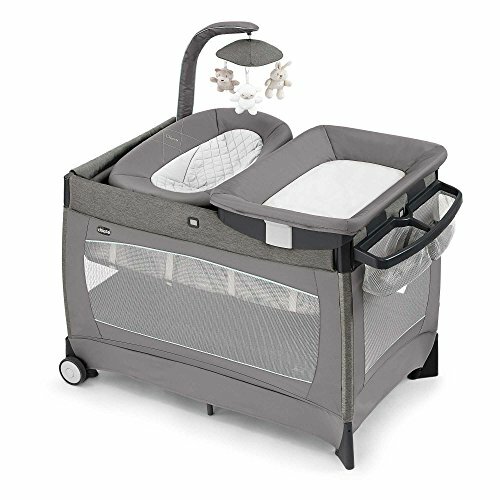 As the perfect combination, this playard offers an infant napper and recliner, bassinet, and changing table. It also features a side organizer that conveniently stores diapers, clothes, and other necessities, so they are all at a hands reach. The adorable mobile with 3 furry friends keeps your little one's attention until they fall asleep. Infants start out using the newborn napper and recliner, then transition to the bassinet, and finally as toddlers they can use the playard for naps and play time. The playard and attachments conveniently fold for easy travel and storage needs. Watch your baby grow and stay comfy throughout their big life stages with the Chicco Lullaby Baby Playard.